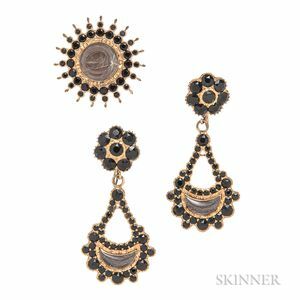 Antique Gold and Glass Suite, a brooch and earpendants each with hair compartment, lg. 1 1/8, 1 3/4 in. Losses and some nicks to glass. Later screwback findngs with evidence of solder, one damaged. Cracked glass to brooch.